This is the public profile of Beate Schellhas, Additional information and high-resolution images are available for accredited press members, to access additional information about Beate Schellhas please login as a press member. 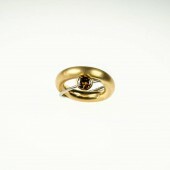 About Beate Schellhas : Beate Schellhas is a passionate goldsmith working independently since 1990. She creates her own jewellery as well as she fulfills the wishes of her customers. Her jewellery design often is a combination of the wishes and the personality of her customers and her knowhow and creativity as a goldsmith and designer. She is passionately collecting fine and precious gemstones and other rare and valuable natural products with great inspiring potential. Her special design skill of combining gemstones with the ideal colour, cut and brilliance each stone together with the corresponding precious metal achieves the perfect design of jewellery. To optimize her work she combines the traditional hand craft of a goldsmith with modern production technologies. A great design is the result of the skilful combination of artistic vision and technical implementation. The search for the perfect solution is fundamental to this process. The design should be aesthetically pleasing as well as supporting functionality. Jewellery design has an additional factor to be considered: the customer with their individual personality. Ideally, the designed jewellery matches and empathises the customer’s personality. Creating such personalised jewellery requires the combination of the jeweller’s aesthetic and technical skills with the wishes and personality of the customer. The result is a unique and deeply personal piece of jewellery. Press Members: Request an exclusive interview with Beate Schellhas.